Is this CRM & Portal app for you? 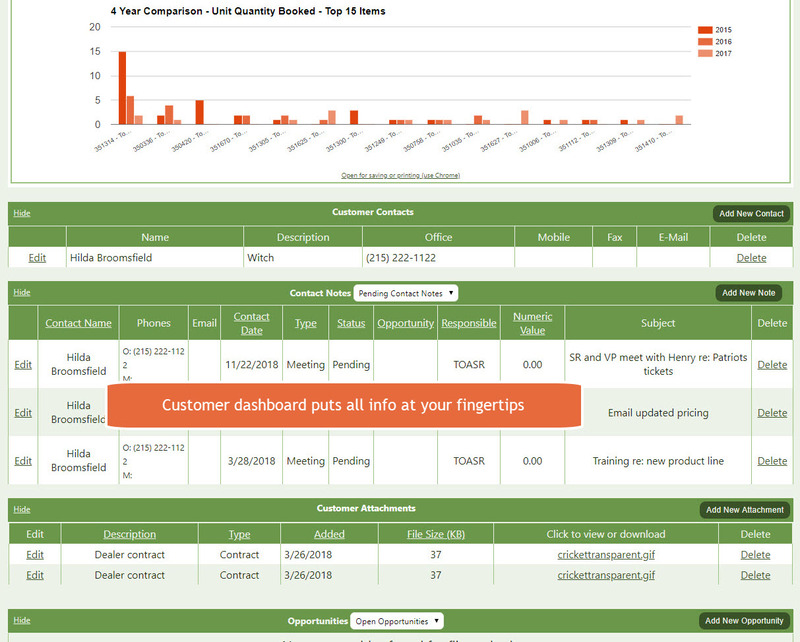 With Crik-IT CRM and portal, sales reps and customers can access current sales reports, dashboards, inventory, order and invoice info, and can enter orders themselves! Available for QuickBooks Desktop and Online. We want to make sure we’re a good fit for your business. Armed with CRM & other portal tools, your reps provide better direction to their customers, resulting in more sales for you. B2B Customer Tools – The easier you make it for your customers to do business with you, the more business you’ll do! Have accessory items? Crik-IT increases add-on sales and reduces ordering errors. 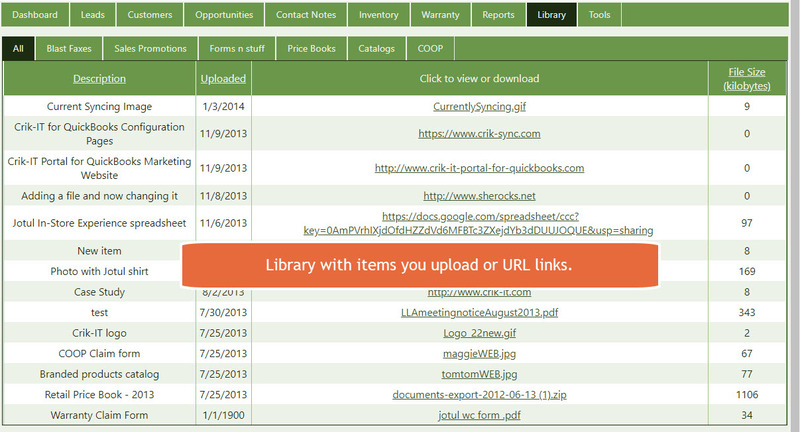 Library with items you add, categorized as you like, & limited to user types you choose. Much more… try us out for 30-days free… it’s easy! Additional information about savagejim could not be loaded. Very nice app for a sales rep portal and a customer portal. Easy to setup, easy to use. Only complaint is the interface is not the most professional looking, some users may object to the non-professional fonts and color choices. Other than that, works as advertised. Additional information about tbrown could not be loaded. I used SalesForce.com with my prior employer and while it has a lot to offer, I think most users get lost in how busy it is. I am a really big fan of Crik-IT, it is way more user friendly. Crik-IT is the best QBD add-on out there! Crik-IT makes everything easier... generating sales reports... getting individual customer information and being able to access information anytime and anywhere. I am so happy I finally started using Crik-IT! Additional information about hanak could not be loaded. It is pretty rare these days to find an add-on application that works well and does what it promises to do. Crik-IT does that and much more. We have definitely increased our ability to serve the needs of our customs by automating processes while we decreased our cost. This is a great product. Crik-IT has saved us a lot of time and money! Being able to access it from all internet devices, has helped us STOP the carbon copy nightmare!! Never a problem reaching customer service! Crik-IT is very flexible to any specific requirements! Now this is what a app should be! I've tried a lot of apps but this one takes the cake. I can get information about my customers or enter orders anytime, even from my android phone. This app is much more easier to use than the other CRM systems I've used... way easier to use the that big one everyone thinks of for CRM. :) The tech support is great too... Usually getting a response within mins of asking a question. No regrets. Additional information about eph44 could not be loaded. Crik-IT makes me so much more productive! Awesome reports. Automatic email reminders. Access to customer invoices. Easy, very easy, order entry. Just a great, easy to use tool! Works great on my tablet too! Additional information about AllyFarmin could not be loaded. Easy to learn the ropes! I'm new to Crik-It, but have been surprised at how easily I learned to navigate. All of my orders have gone through quickly, and I'm learning to use it more often for a wider range of things. Additional information about MelMBombay could not be loaded. Great ppl to work with. Worked with a few of the big brand apps, but the ease and simplicity of Crik-It is far superior. Additional information about Gotime77 could not be loaded. It is very easy to use. I tought myself in one day!!! Additional information about SushiMaki could not be loaded. Crik-IT has given our customers the ability to enter orders themselves, saving our office tons and tons of time. 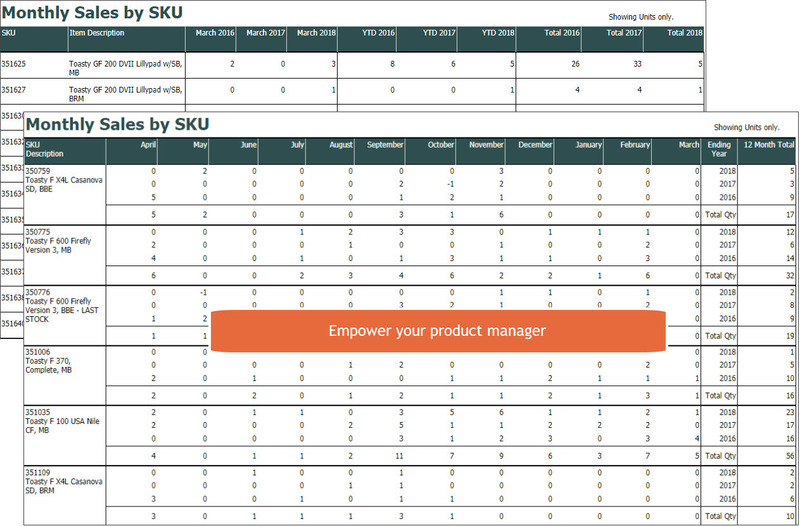 Plus, with Crik-IT standard orders can be set up which makes order entry so easy. Crik-IT's customer service is awesome too. If you need your reps or customers to enter orders themselves, give Crik-IT a try. You won't be sorry. Additional information about Marty2475 could not be loaded. Stephanie than you for solving all of our small issues. Our Sales Reps are able to log on, get pricing and place orders. What a great app..
Additional information about Gabby could not be loaded. Sales Reps love the ease! Everyone loves the support!!! Everybody's happy with our new Crik-IT APP! It's EFFICIENT! Our Reps can easily use their smartphones or tablets to enter orders or check sales numbers and it's EASY, so they actually use it! Crik -IT's customer service is superior, and they are always there to help you!!! 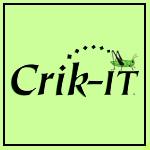 We are thrilled to be Crik-IT users and HIGHLY RECOMMEND this APP! Five Stars from us! Additional information about nmbr1sales could not be loaded. We needed a way for our reps to access information and submit orders. We looked at QuickBooks Online but it doesn't have the inventory and sales order features we need, so we did a free trial of Crik-It. During the trial we had several conversations with Crik-It and they were able to configure Crik-It to meet our needs. It's everything we were looking for and the customer support is really top-notch. We're even rolling it out to our best customers! Additional information about Larry could not be loaded. Excellent for the Sales team. With this program, we are able to completely stop all handwritten tickets. Our salesman have immediate inventory and sales price knowledge. Additional information about Brewer could not be loaded. We've found that this app does everything we were looking for and it's integration with QB makes our sales process work so much better. As a B2B business there are a few features that QB's just doesn't give them to proper ways to support but other wise we love it! And the support team is incredible! You won't find a better supported product out there; quick, attentive, helpful AND there have even been times when they contact us about something they've seen! Great product and would highly recommend. Additional information about GVCSteve could not be loaded. Before giving Crit-IT a try, I read all the reviews and everything they posted on their very informative web site. I then spoke with a company representative and installed the trial. After the first day I could see that this add-on would not only address the issues I had, but also make us a better, more customer focused, company. After four weeks of testing I can say that this product exceeds my expectations. What I didn’t expect is how customer focused the company is and how they anticipate your needs, answer your questions – sometimes before you even ask them - and how creative they are in addressing business needs that help you delight your internal, as well as, external customers. I guess you can tell that I think this is a wonderful product and company. Additional information about rb1129 could not be loaded. A MUST for any organization with Field Sales Reps! Crik-it eases the ordering process for everyone involved! We've used other products in the past, and this one is the easiest to use, has the features that are necessary (nothing bulky and unimportant), and the accessibility for anyone (yes...even those lacking technology skills!). You won't find a better customer service person outside of Stephanie! Trust me...Crik-it will help your bottom line! Additional information about CrikIT could not be loaded. "All is well and everyone LOVES Crik-IT. User rate is 100% compared to 30% for [the product they had been on before Crik-IT]." Thanks for the great review and feedback! 1of 1voted this comment as helpful. Additional information about Jennifer496 could not be loaded. Crik-IT adds a whole new dimension to our business relationship with our customers! With it our customers have access to our inventory and their account 24/7- which is particularly helpful to them when our office is closed for the day & on weekends when we are not available to answer the phones. In addition to being able to view inventory/check stock, they also have access to their account- they can view invoices, account balances, product purchase history & open orders. They can place orders, submit warranty claims, keep track of display units, direct link to manufacturer websites for detailed product information-- they can even view a library of our recent announcement & sales/promos. Crik-IT provides them with the tools they need to be able to help their customers at any time. Crik-IT also has exceptional customer service- they are able to customize reports/screens to best suit our business needs. We would recommend Crik-IT to any business- EXCELLENT reviews all around!! Additional information about valerieVK could not be loaded. Between the sales manager and myself, I believe we use this tool the most. For me, this tool is huge dealing with different time zones. This allows my customers to preview our inventory, pricing, tracking information immediatly, no lost sales for those who use it. For Bookkeepers, you have the abiltity to print copies of missing invoices, get invoices emailed not to just one email address but three!! I can print out reports with ease, export with no problems...and it just keeps getting better and better, Easier and Easier to use. Every phone call I am on, I bring up Crik-it and how everyone should be using it. Additional information about absa23 could not be loaded. crik-it is an awesome tool that we've been using for years! 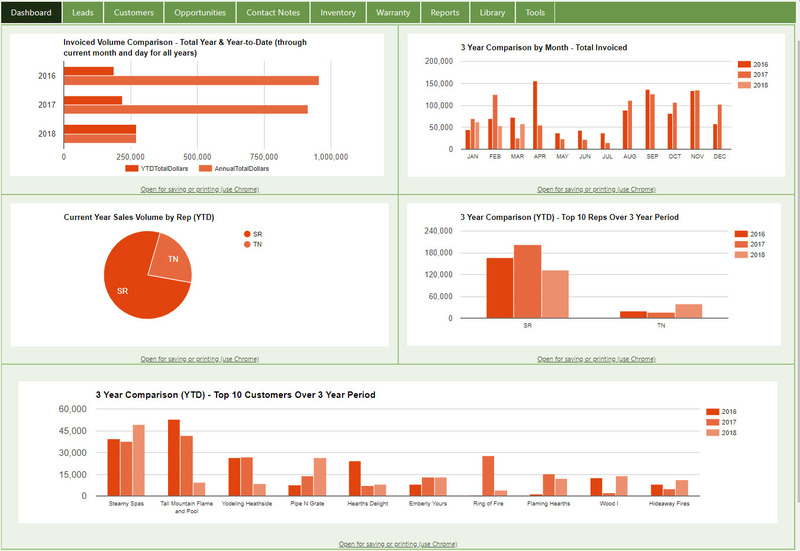 crik-it allows our customers and sales reps to access an incredible amount of information with such ease! greatly reduces incoming calls to our customer service department..we and our reps can get our hands on sales reports when we need them...our customers can file a warranty claim (plus photos!) any time and our technical department can process the claim right online....AND, contact notes allows our staff and reps to keep on top of what's happening with our customers! crik-it is an awesome tool that we've been using for years! Additional information about Kuma could not be loaded. Adding Crik-IT to QuickBooks is pure Synergy! For years, we have been trying to come up with a reporting solution that is built with the full consideration of the Sales Rep. While other solutions may be available, they always felt difficult to learn. Crik-IT's learning curve is pretty gentle, especially considering the level of support that is available for FREE (take a queue Intuit). All of our questions and inquiries have been acknowledged within minutes and solutions generally offered in very short order. I don't think we've ever waited more than 24 hours for a solution, including weekends! Support has also been very quick to offer customized solutions, when possible, to really fill our specific needs. Bottom Line: If you're a small to medium business using independent sales reps, you need to give this a try. Packages start at just $29/month! Customer Service Package $29/mo 1 Includes 1 in-house user. Yep, we're here to help. In fact, our users are astounded by our response times. Contact us is by email: support@crik-it.com. Or feel free to call us, if you prefer... we'd love to talk to you! It's easy! Depending on the size of your QuickBooks file, you can be up and running in as little as 15 minutes. And, if you have any problem, just call us or chat with us and we'll walk you through it! What versions of QuickBooks does Crik-IT work with? 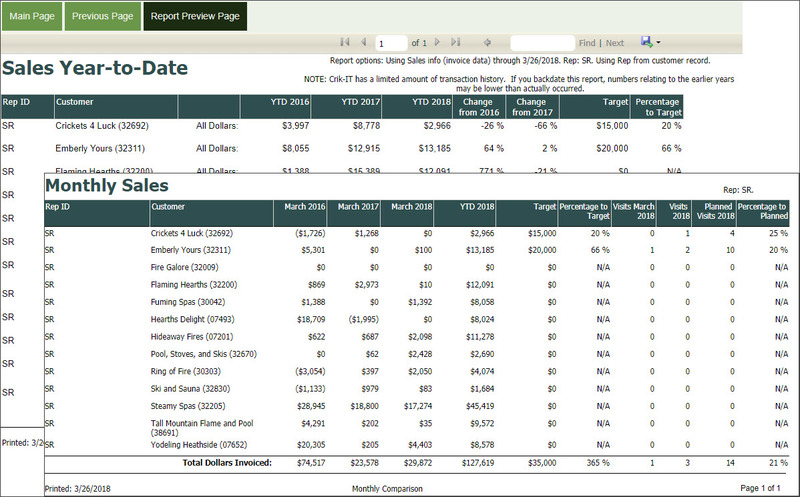 QuickBooks Online... and QuickBooks Pro and Premier 2011 or newer. Enterprise 11 or newer. What if Crik-IT looks really great for us, but we need a little tweak? Call us! We want to know what our users need. This is how we continue to make Crik-IT better and better... by listening to our users! How long has Crik-IT been around? How many users use Crik-IT? And what do they use it for? Crik-IT was born in 2007. We have thousands of users accessing Crik-IT on a daily basis. Tens of thousands of inventory queries, orders entered, warranty claims submitted, sales reports run, invoices printed, and more are done in Crik-IT each year. 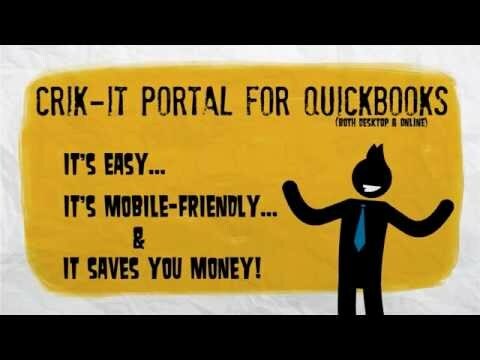 See www.crik-it-portal-for-quickbooks.com for more about how different users use Crik-IT.